Title page of the twelfth edition. 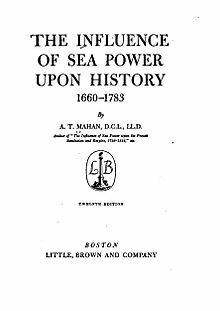 The Influence of Sea Power Upon History: 1660–1783 is a history of naval warfare published in 1890 by Alfred Thayer Mahan. It details the role of sea power during the seventeenth and eighteenth centuries, and discussed the various factors needed to support and achieve sea power, with emphasis on having the largest and most powerful fleet. Scholars considered it the single most influential book in naval strategy. Its policies were quickly adopted by most major navies,     ultimately leading to the World War I naval arms race. It is also cited as one of the contributing factors of the United States becoming a great power. The book was published by Mahan while president of the US Naval War College, and was a culmination of his ideas regarding naval warfare. The book then goes on to describe a series of European and American wars and how naval power was used in each. ^ Seager, Robert (1977). Alfred Thayer Mahan: The Man and his Letters. Annapolis: Naval Institute Press. p. 2. ISBN 0-87021-359-8. ^ Harding, Richard (2006). Naval History 1680–1850. Burlington: Ashgate. p. 224. ISBN 0-7546-2532-X. ^ Downs, Robert B. (2004). Books That Changed the World (Rev. ed.). New York: Signet Classic. p. 302. ISBN 0-451-52928-6. ^ Wimmel, Kenneth (1998). Theodore Roosevelt and the Great White Fleet: American Seapower Comes of Age. Washington: Brassey's. p. 44. ISBN 1-57488-153-1. ^ Turk, Richard W. (1987). The Ambiguous Relationship: Theodore Roosevelt and Alfred Thayer Mahan. New York: Greenwood Press. p. 10. ISBN 0-313-25644-6. ^ Ferreiro, Larrie D. (2008). "Mahan and the 'English Club' of Lima, Peru: The Genesis of The Influence of Sea Power upon History". The Journal of Military History. 72 (3): 901–906. doi: 10.1353/jmh.0.0046. ^ Patrick J. Kelly, "Militarism in a Global Age: Naval Ambitions in Germany and the United States before World War I." German History (2013) 312 pp: 259-260. ^ Asada, Sadao (2006). From Mahan to Pearl Harbor: The Imperial Japanese Navy and the United States. Annapolis: Naval Institute Press. ISBN 1-55750-042-8. ^ Motte, Martin (1996). "L'epreuve des Faits: ou la Pensee Navale Française face a la Grande Guerre". Revue Historique Des Armées. 1996 (2): 97–106. ISSN 0035-3299. ^ David Scott, "India's 'grand strategy' for the Indian Ocean: Mahanian visions." Asia-Pacific Review (2006) 13#2 pp: 97-129. ^ Toshi Yoshihara and James R. Holmes. "Can China Defend a “Core Interest” in the South China Sea?." The Washington Quarterly (2011) 34#2 pp: 45-59. ^ Peter J. Hugill, "The American Challenge to British Hegemony, 1861–1947," Geographical Review (2009) 99#3 pp: 403-425. St. John, Ronald B. "European Naval Expansion and Mahan, 1889-1906." Naval War College Review 1971 23(7): 74-83. ISSN 0028-1484. Argues that key Europeans were already set to expand their navies and that Mahan crystallized their ideas and generate broad support.